While packing for our Disney cruise, I wanted to pack a little something extra to give in addition to monetary tips to our room stewards, servers, nursery workers, and everyone else who helps to make the trip a little extra magical. 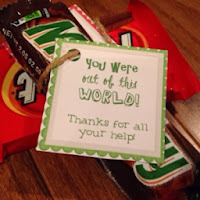 There are lots of things I have read about people giving from calling cards to snacks. From what I have read, even with all the amazing food on board the ship, cast members have to purchase candy and other treats for themselves. So I thought they might enjoy some supplementary candy to brighten their day. 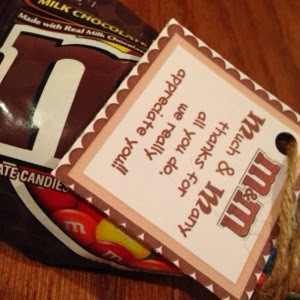 I found these great printable tags here. 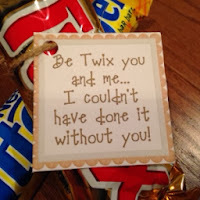 The site had lots of options of sayings that went along with popular candy brands. So they do all the clever thinking for you. 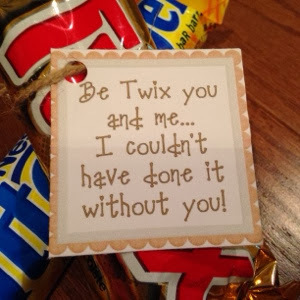 I just resized them down to 2''x2'' because I thought they were a tad too big, printed them out on some cardstock, cut them out and attached them to their respective candy bars with some twine. 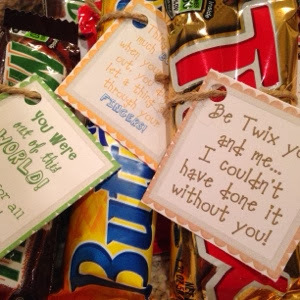 Voila, super cute "thank yous" to take on the trip. Not to mention way more budget friendly.